Here is a quick luxurious way to cleanse and nourish the skin while dissolving surface impurities and makeup. 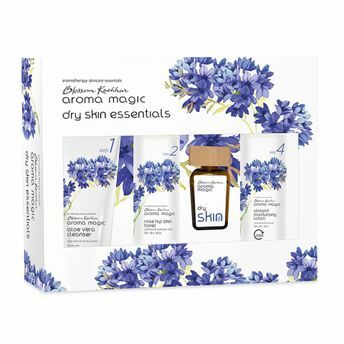 The Aroma Magic Dry Skin Essentials kit is a 4 step process to soothe and revitalize dry skin. The most common cause for dry skin is the loss of moisture and the inefficient production of natural oils in the skin that leads to an uncomfortable tightening of the skin, especially after a swim or a bath. Dry skin also causes dullness, fine lines and flaky skin that further result in itchiness. Fortunately for you, our Dry Skin Essentials will provide the right resolution and deliver gorgeous, immaculate skin. This kit comprises of a rich collection of Aloe vera, Rose hip, Almond and Jasmine, packed with other skin loving nutrients that help balance the moisture in the skin. Never before has the CTM regime been complemented with an aromatherapy blended skin oil. Follow the simple steps to relish exceptionally hydrated, rejuvenated and well nourished skin.